Space-power-pop rockers, Sunset Valley's latest, Icepond, is a slower, well-versed pop record, delivering sonic melodies, well-thought hooks, and less noise than in the past. It is the lack of noise and speed that makes Icepond a hard sell, unlike Sunset Valley's debut, The New Speed, an instantly accessible pop classic. On their sophomore release, Boyscout Superhero, the band started to move closer to the sound of Icepond, however still clinging on to the commercial viability of The New Speed. With Icepond they let go of any major label notions, dropping the slick power-pop and going straight for quirky, experimental indie rock with more going on in it than their previous stuff. Instead of just hammering out a song and beating you over the head with hooks, this time around the words and the music slowly creep into your mind, floating there as you settle into the song, warming up to it little by little until you're hooked. 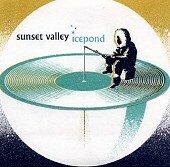 It is Sunset Valley's new found ability to attract listeners, the talent to let the listener sink into the song, instead of the other way around, that makes Icepond a true winner.